Jet passenger travel began in the 50s. The De Havilland Comet was the World's first jet airliner. The first scheduled service began on 2nd May 1952 between London and Johannesburg. It was a great success, setting new standards and speeds of up to 500mph. Initially, the Comet established a reputation for trouble free reliability. Tragically this reputation was destined not to last. A number of unexplained crashes revealed a fatal design flaw. The Comet's shell was not strong enough to withstand the constant changes of air pressure. All Comets were grounded in 1954 and jet passenger travel came to a temporary halt. It was left to the American firm, Boeing to fill the void. The prototype 707, the 367-80 (the "Dash Eighty") first flew in 1954. It was developed from the B-52 bomber. 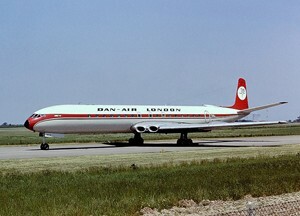 Although, BOAC started the first ever transatlantic jet service using the radically redesigned Comet 4 - the Boeing 707, with its greater passenger capacity set the standard. Pan Am, too came to dominate the transatlantic jet market with its 707 service. BOAC quickly switched to 707s as well. There was literally only one way to travel in the early 50s - first class. Air travel was expensive and passengers got as many frills as possible thrown in. The industry always aware that there was great potential for increasing passenger numbers if fares could be lowered. It was bit of a chicken and egg scenario. Many people would have liked to fly, but simply could not afford it. Yet if many more did fly, fares could come down. Air travel in the 50s was much more regulated than it is today. All fares were fixed by the International Air Traffic Association (IATA). It seems almost inconceivable today, but IATA dictated exactly what could be charged on any particular route. Airlines could compete on standards of service, but not price. Hence a desire to offer the passenger the very best prevailed. American operators had already introduced "Coach" class services on domestic routes and wanted to do the same across the Atlantic. European operators resisted. They had a limited number of planes and the thought of having to offer a cheaper service threatened revenues. An agreement was finally reached, after Pan Am threatened to leave IATA and go it alone. From the 1st May 1952, airlines could offer a reduced fare for a reduced service. In the end, it was the lure of thousands of American tourists and the much-needed dollars that they would bring that swayed decision. Most airlines were state owned and governments took an active interest in the decision being reached. The new service was "Tourist" class. Tourist fares were up to thirty percent cheaper than the Ordinary (First Class) fares. This meant that an off-season return ticket went down from 254 to 173 13s. In today's money, these fares would be 4496 and 3062 respectively - not exactly cheap. It would have meant the choice between a new car or a holiday in the USA, even for well off families. Not surprisingly, tourist class travel was still only for the privileged few. However, it did have a dramatic increase in the numbers flying showing that there was a huge pent up demand for flights if the price was affordable. To offer the reduced fares, the airlines had to offer passengers considerably less comfort than first class. There were fifty percent more seats on the plane than in a typical first class layout. All "frills" expected in first class were removed from the service. Passengers were expected to pay for all meals and there were no alcoholic drinks served, either complimentary or to buy. Journalists, given a chance to sample the new tourist class fares in one of the first flights across the Atlantic on Pan Am's "Liberty Bell", found the food expensive. The meal served on this flight - beef, peas and potatoes, two rolls and butter, two pastries and coffee cost $1.75 (12s 6d). At the time, a similar meal would cost only 4s on the ground. By contrast, BOAC was offering a full four-course dinner for 10s 6d on their tourist service. In spite of the only modest reduction in price, tourist fares did increase the popularity of flying. By 1957 tourist class fares made up 70% of all air travel. 1957 was another important date for the development of air travel. Like most services, tourist had got better. By 1957, a paid for bar service was available to passengers and the seat pitch was around 36" to 38", roughly equivalent of to that of premium economy today. In 1957, a new class of travel was proposed at the annual IATA conference and agreed - economy class. Economy class was to offer passengers a reduction in the tourist class fare by twenty percent. This reduction was, of course, to be paid for by a reduced service. In economy the airlines were only allowed to offer a seat pitch of up to 34", with a restricted recline angle. Cabin service was to be limited to inexpensive sandwich meals with tea, coffee or mineral water. No hot food was allowed to be provided (paid for or free) and no giveaways other than boiled sweets for take off and landing were to be allowed. Given that the trip still took ten to twelve hours and that seat design has improved over the years, today's economy service with hot meals and drinks thrown in looks, if not luxurious, but certainly better than it's fifties ancestor. When the new economy fares came in, journalists were sceptical. In an article describing the new service, a reporter for "The Aeroplane" voiced concern that once someone had tried this new service he would not use it again. The new class of travel meant that in the late fifties the airlines could offer four classes of service - economy, tourist, first and deluxe. Some configurations offered all four on the same 'plane, although this was rare. 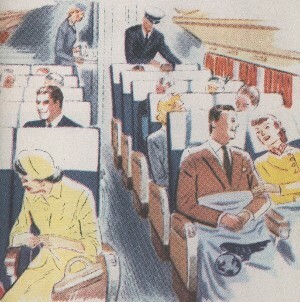 BOAC offered a three-class service between London and New York by DC-7 with 16 first-class seats, 17 tourist and 37 economy seats. The first-class seats were generally at the rear of the plane. The main reason was that the doors were at the rear so, as today first class passengers were off the plane first. Deluxe services gave passengers the very best that the airlines could offer. On the new jets, there were no flat beds or separate bars. Passengers, instead, had wide reclining seats and superb gourmet catering. The four class arrangements did not last long. Pan American only offered first and economy on its transatlantic jet service by 707 from 1958.